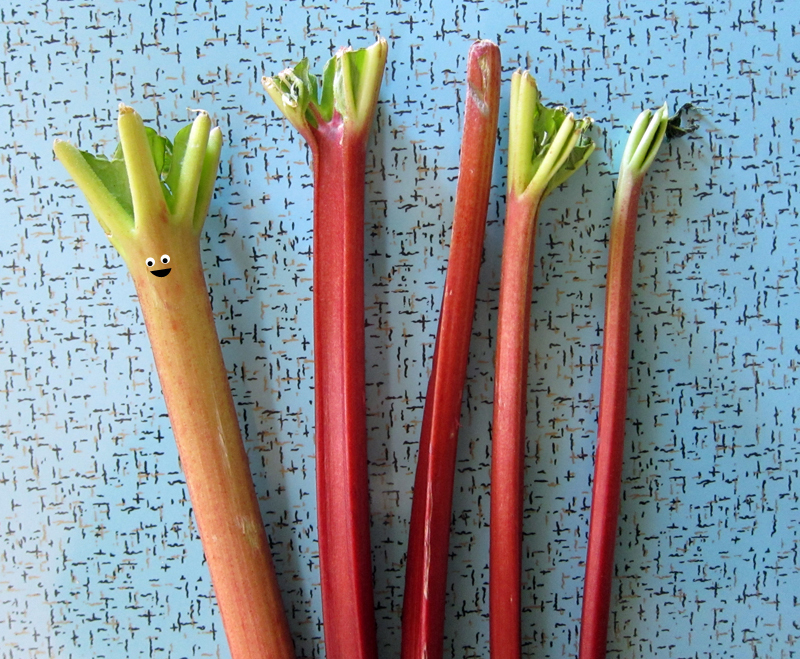 Lately, it seems like each visit to the market, I come home with about a dozen stalks of rhubarb. Sure, I love the tart fruit that makes drinks taste so much more awesome, that helps put brown butter to good use, lends a hand towards a fine chutney, and makes a strawberry crumble or a pudding cake sing. But as a completely visual aside, I like how the stalks pop out of my tote bag and can picture them with googley eyeballs joining me along on my journey back home. Or not. Off with their heads! 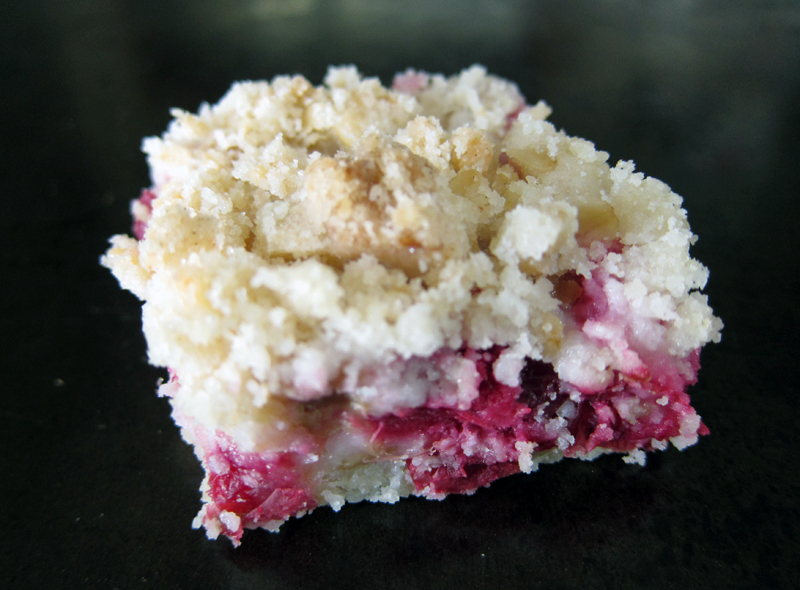 When I spied these rhubarb ginger bars over at eat make read, I couldn’t wait to make them. They seemed way less labour intensive than the brown butter ginger bars I tried last year but similar to the cranberry lemon squares I’ve made in the past. However, I waited too long. The dozen or so rhubarb stalks were whittled down to 5. No matter! I decided to sub in another fruit. Strawberries or raspberries would be a wonderful option, but I had neither. I did find a half bag of cranberries in my freezer so I went with it. These bars would be tart ones, no doubt. Luckily, the combination of 2 tart fruits (with enough sugar to sweeten the deal) created a winning square! I should add that a buttery crumble topping didn’t hurt things either. The ginger isn’t too strong, so if you’re not sure about the ginger, leave it out. Or double it up if you want more of a ginger jolt. I served these over a busy weekend of entertaining and everyone raved. Now, about those holidays….this summer, we’re planning a road trip down to Portland, OR and then across the midwest until we head up to Ontario to visit my 2 new nieces and hang out with family (it will be my first trip back home since my mom died 2 years ago, so I’m super excited!). Instead of going back through Canada, which we’ve done before, we’ll head back through the more northern states…and that part is still super fuzzy (which is why I left it off the map). It’s fun figuring out a route using google maps, but we’re certainly open to ideas and options! 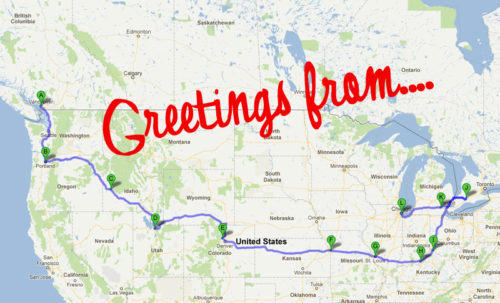 Our trip will be done on the cheap with lots of camping and picnics, but I’d love to hear your favorite cute towns, best thrifting, most awesome brew pub or yummiest breakfast/ice cream/donut/etc. Also, best hikes and cool, crazy art…like I hear the Sawtooth Mountains in Idaho are awesome for hiking & camping! And this piece in the New York Times makes me want to visit the “Enchanted Highway” in North Dakota to view amazing folk art sculptures! I’m also pretty sure we’ll end up in Louisville, KY and Ann Arbour, MI for a stop. So if you’ve got some recommendations, send them my way! Leave a comment with your tips and suggestions! 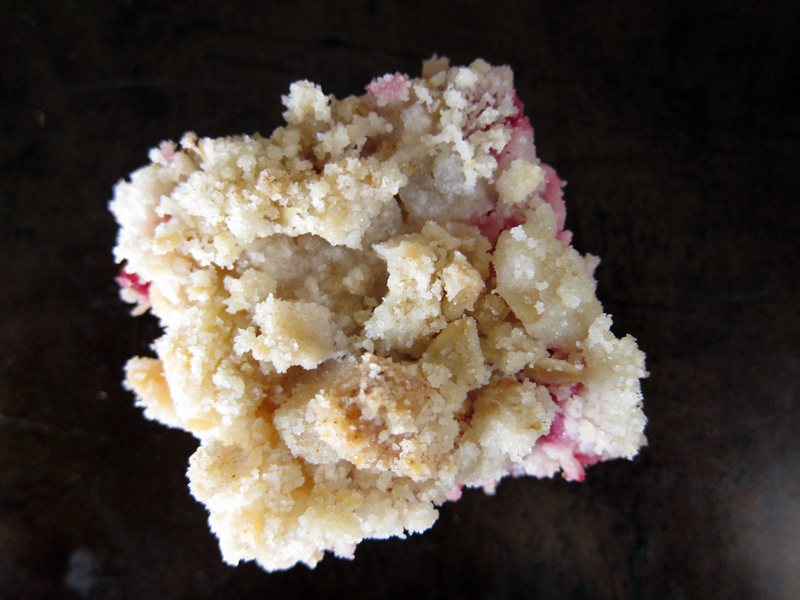 elsewhere: I don’t stop with the rhubarb love….over at Poppytalk get your double dose of rhubarb with some double ginger rhubarb crumble. It’s pretty fantastic and if I can brag for a bit, my photos turned out super lovely too! Preheat oven to 375F. Butter an 9×13″ pan. Prepare the dough by combining everything but the egg into a large bowl. Cut the butter into the flour/oat mixture using a pastry cutter or your hands until large crumbs form. Add in the egg and work that into the mixture. Dough will be crumbly. Pat half of the dough into the pan. In a large bowl, mix together all the topping ingredients. Spoon the fruit mixture evenly over the dough. 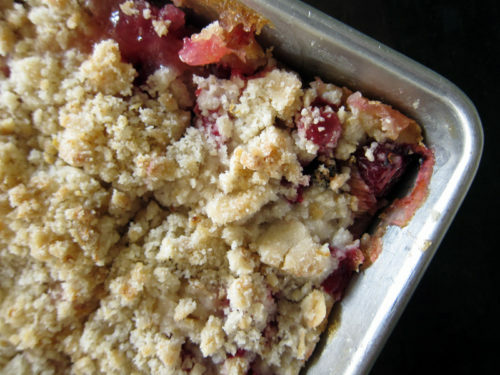 Crumble the remaining dough over the fruit layer. Bake for 45 minutes. Cool completely and then cut into squares. Not stopping in Wisconsin? Come by and see us if you’re in the mood for some great cheese. I could show you the antique shop where I got my cute striped tumblers. Have a great trip, which ever route you choose! I just made rhubarb cherry pies, but your rhubarb cranberry combination sounds delicious. And Denver! Well, Great Divide brews some great beers. As for food? Linger, The Kitchen, Euclid Hall and Illegal Pete’s are all some of my favorites – Illegal Pete’s is a must when you visit town. Like Chipotle, only better. And, uhh.. if you need a place to crash during your road trip, I’ve got a spare room in a pretty rad loft in the heart of downtown. PS – Snooze for breakfast! And The Market for a deli style lunch. I’ll have to be honest with you. I’ve never purchased rhubarb before. And I’ve only tasted it once in a strawberry-rhubarb pie and didn’t like it. I guess it’s because I prefer super sweet things that I have an aversion to it. That being said, I like the sound of these squares but perhaps without the rhubarb, as they do remind me of your cranberry-lemon squares. I love those squares and I’ve already made them twice. So jealous of your trip to Portland, Oregon!! I really wish I could go there one day and check it out. The only trip I’m taking this summer is to Ottawa for Canada Day long weekend. Have a great road trip!! Enjoy your time with your family. Brittany, perfect with a cuppa!! Ashlae, wow, thanks for the trip and the offer! I’ll let you know when we get closer to our trip and it would be great to meet up! Love your Denver tips, Emily!! Thanks a ton and I had no idea the CS tea factory was there….kinda tempting! Joanne, you can add more sugar to make rhubarb sweet. It can be done! I’m excited for our trip, and if we make it to Toronto, I’ll let you know! Maybe we could meet up finally. I’ve very tempted to give rhubarb another try, with extra sugar, of course. Oh yippee! That would be awesome if we could meet up! Send me an e-mail. I wish I could give you some awesome road trip recommendations, but alas I’ve only ever done the South of the United States, and I only had three days to do it in! oooh, does this make me want to go on a roadtrip. my only suggestion would be to dip a bit lower into utah and camp outside arches national park just to see more of utah because it’s great! i can even bring you some maps 🙂 ack! maybe we should meet you in utah and then head back ^__^ i love all those places to camp! These look amazing! I’ve never seen fresh (or frozen) cranberries here, but I do love rhubarb! Yum. Too many rhubarb recipes is NEVER a bad thing! Those big pink stalks never fail to make me happy either. And these bars look delicious! For crazy-fun hiking check out Moab, Utah! I see you’ll be driving through St. Louis- YAY! You are most welcome to stop by my place for a home-cooked Indian meal- drop me an e-mail if you like. (a) In St. Louis, Pappy’s Smokehouse is famous for its BBQ. (b) Our botanical garden has a lantern festival going all summer which is supposed to be pretty spectacular. You can combine a trip there with a lunch at a cute place called Sweet Art. (c) Local Harvest Cafe has good locally sourced food. Depending on the day of the week you are here, you might catch one of the area’s Farmers’ Markets. wow! 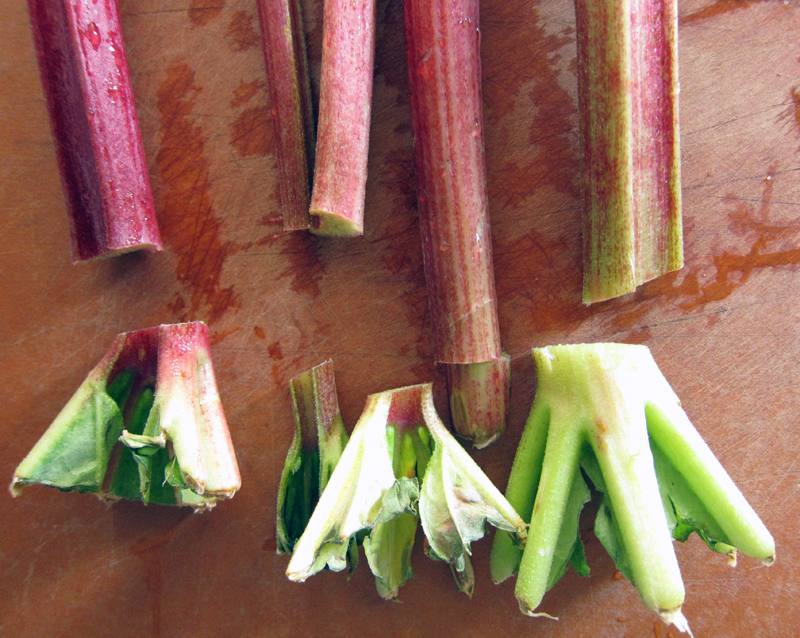 your rhubarb treats look gorgeous! i’m totally obsessed with rhubarb and it’s lovely tangy-ness. i’ve never tried it with ginger though, so this recipe is definitely bookmarked. i love road trips!! 🙂 and yours sounds like a blast! I could write you a tome on what to do in Kansas City, but I assume you’re only staying for a little bit so I’ll cut it down to the highlights. Shop at the Rivermarket Antique Mall. Eat at Lulu’s Noodle Bar (casual), Westside Local (a little nicer) or Extra Virgin (the best tapas in the whole world). See the Nelson Art Museum and picnic on the grounds if you want. Oh and if you’re looking for barbecue, get yourself to Oklahoma Joe’s. Order the Z-Man and don’t question cheese on a bbq sandwich. It’s heaven. In St Louis, check out Cherokee Street if you like antiques and strolling around an up and coming art scene. Take a tour of the brewery (nearby) and grab a sandwich from Blues City (don’t be scared of the line). Picnic on the grounds of the Arch and round your trip out with Ted Drewes Frozen Custard. If you like animals, the zoo is top notch and free (and there’s plenty of free parking on the street too). Let me know if you need more suggestions on either city! Hey there! I noticed you have Salt Lake City marked and that is where I live! Let me know what day of the week and time of day you plan on spending here and I’ll tell you where you can find the best breakfast/lunch/dinner/snack. And if you are looking to do a quick hike or some kind of outdoor activity, I can help you there as well. I love road trips, so I’m excited for you! Love the little rhubarb smiley. + That is one serious road trip! In Portland, don’t miss Clyde Common, Everett Street Bistro (especially breakfast), Pok Pok if you’re in the mood for Thai food, and awesome happy hour at Cafe Mingo. Your road trip sounds amazing! I’m jealous. I’m dying to go to the City Museum in St. Louis, is that on your itinerary? And think of all the BBQ you’ll get to eat! I’m going to Chicago in a week and a half, so maybe I can advise later. I too am obsessed with buying rhubarb every time I see it. I even made a list of different things to do with it. I tried the upside down cake from Eat Make Read, but didn’t totally love it. I liked doing a compote on meringues sprinkled with pistachios. I am surprised that you are going to stop in Lexington, Ky on your road trip. Not many people stop in our town on a cross country road trip. In the area, we have great hiking, lots of bourbon distilleries, and some amazing little hole in the wall restaurants. We would love to take you on a hike or to lunch at one of our favorites while you are in our town. If you want the best sandwich in St. Louis, you should stop by the original Amighetti’s on the Hill and get a “Special”. The other locations haven’t mastered the sandwich and the Hill comes complete will all sorts of great Italian grocers to check out too! You might not venture this far north, but if you’re in Grand Marais, MN then the Angry Trout is pretty fab. Vegetarian: Seva. Get the yam fries. Ethiopian: The Blue Nile. This is the best Ethiopian I’ve ever had (not that I’m an expert). Indian: Shalimar is my favorite, but Raja Rani is good too. More Middle Eastern: Oasis. I really miss their cheese delight sandwich. Also The Earthen Jar. Right next door to Jerusalem Garden, & buffet by the pound! Salvadoran: Pilar’s Tamales. This was an infrequent food cart when I lived in town, but is now an actual cafe & supposed to be quite good. Pizza: Cottage Inn. Sesame seed crust! Eastern European & pastries: Amadeus. Diners: The Fleetwood is classic A2, but my favorite is (was?) Frank’s. Breweries: A2 Brewing Co, Grizzly Peak. Bars: There are a million. Old Town is probably #1. Ashley’s, Red Hawk, Babs’. If you want grunge & cheap drinks, the Heidelberg (downstairs) and the 8-Ball. You will probably want to go to Zingerman’s. While the sandwiches are good, I personally think they’re overrated, and they’re certainly some of the most expensive in A2. The A2 farmer’s market is also very good, since you’re smack in the middle of farm country. So funny, I was just going to post that you must go to Zingerman’s if in Ann Arbor- and then to remember Jerusalem Gardens- amazing felafel! You can’t get anything like it in Portland. It’s much harder to recommend stuff in Portland, EVERYTHING is amazing (except the Middle Eastern food, in which Detroit is the best)! Por Que No is great for Mexican, Lovely 50-50 for pizza,or Noble Rot for a fantastic city view, wine, and mac and cheese. Have a great time, road trips are the best! If you like biking, Sauvie Island is a great place to stop right outside Portland. It’s about 18 miles around and very few cars drive out there so you mostly have the road to yourself. There are a couple of cute little farms on the Island but mostly it’s just a lovely bike ride sans cars. Only takes a few minutes and it’s super cute. Check out Ale-8 One in Kentucky. It’s a locally made soda that tastes like a combination of ginger ale and lemon lime soda. It’s really refreshing! Otherwise, there is a small pocket of Amish Country near Lanesboro, MN. It’s beautiful country and you can hire a guide to drive in your car with you to the various farms. It’s a beautiful town to visit. However, I am partial to the Twin Cities with the various tasty eats. I would recommend the Blue Door for a Juicy Blucey, which is a burger stuffed with melted blue cheese. YUM! Zingerman’s in Ann Arbor is a must for anyone that loves food! oh wow those look SO delicious! 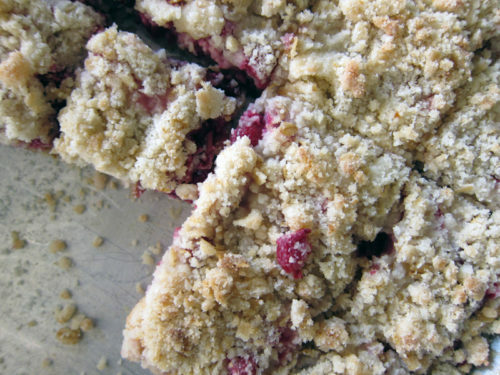 rhybarb and cranberry together with a crumb topping — mmmm! and cute little face on the rhubarb:) thanks for sharing! These bars so yummy. I love rhubarb in baked goods. You are so lucky to be going on a road trip this summer. I love road trips. This is the first thing I am going to make when I go home to the motherland! I married in Hawaii and have been “stuck” here ever since. I love love love Rhubarb and grew up eating it by the stick (dipped in sugar) in Saskatchewan. I miss it dearly! I am going home this summer and will be making this heavenly recipe first thing! i can not wait! Bijoux, give rhubarb a chance 🙂 And I’ll let you know about Toronto! Lori, yes! Looking forward to some desert camping though we wont’ make it to Arches this time around. Ursula, just use another fruit – I think strawberries or raspberries would be swell! Thanks Joanne, they were perfectly yummy! Thanks Reale, we’ve been to Moab before and enjoyed a hike or two, I don’t think we’ll head there on this trip though. Thanks!! Thanks Karen, we’re super excited too! And rhubarb and ginger is an awesome combo! Heather, thank you!! You said the magic words: frozen custard!! Thanks so much Crystal – I’ll definitely hit you up for recommendations if we end up staying for a bit in SLC. Lydia, that compote sounds amazing – like a pavlova? Yum!! I’ve been to Chicago before and I so want to hit up Floriole bakery. You should go too!! Adrienne, I like the sound of that. Thanks! Leanna, oops! I meant Louisville!! Somehow I get the 2 mixed up (but I think we’ll be passing through Lexington as well, so I’ll hit you up for information if we do a stop there as well. Thanks! Pete, thanks so much! I’ll check it out if I’m in the area. Holy smokes, Eileen!!! Thanks for your recommendations!! Yay!! I’m guessing we won’t go hungry in Ann Arbor! Thanks Susan, I’ve heard that about Detroit. And I love portland to bits. Kate, thanks so much. Those links are amazing!! Deanne, I’ve always wanted to visit Sauvie Island! Thanks for the rec! Morgan, that’s what I hear! Thanks. Yay, glad you liked Caralyn! Andrea, stuck in Hawaii, eh? Ha!! We did that too with rhubarb in Ontario – good memories! I love the googly eyes! We live north of Detroit, so that may be out of your way, but you are welcome to stay with us, if you like or we can meet up in Ann Arbor! Have so much fun! Thanks for the tips, Crystal!! I had no idea you were from KS, cool, I’ll totally check out your recs for cheap & delicious bbq! NicoleD, thanks so much! I’ll be definitely sending you an email as I’d love to meet up! Maven, OKAY!!!! I’d love to meet you….I’ll contact you beforehand if we’ll be passing through! Making your Brown Butter Rhubarb Ginger Bars tonight (actually did the first few steps last night) and just now saw this recipe, which does seem a little easier! Hopefully the BB ones will live up to expectations for all the labor! As for your upcoming trip, come back via Duluth, MN (at the tip of Lake Superior) to visit us and peruse the beautiful North Shore and lots of great hiking/camping. Elsewhere in MN also you can find many of those fun giant “roadside attractions” that someone else mentioned. My husband and I used to hit as many of those as we could. We have also been to North Dakota’s Enchanted Highway that you mentioned. It’s neat but pretty far in the middle of nowhere unless you’re taking that I-94 route across ND anyway. South Dakota has much more to see while you’re going across the state. Lindsay, the bbsquares are good too (but yes, super labour intensive). I want to see the enchanted highway, but it really is in the middle of nowhere – we’re making no plans! I’ve been to Duluth before and thought it was a great little town! I remember eating some very delicious pancakes at a diner there. Thanks for the tips! Catching up on my blogs since I just returned from my own 2-week roadtrip! I followed the Nez Perce Trail from Washington state, through Oregon, Idaho, Montana, Wyoming, and South Dakota. 6 states, 4000 miles, all of it breathtaking. I can see that you already have your route mapped out, but if you have the time, I *highly* suggest you veer off course & make a day trip through Yellowstone Nat’l Park in the northwest corner of Wyoming. It’s like nothing you’ve ever seen before. You won’t be sorry. Last week was my first time and I believe I left my jaw back there amongst the bison, the bears, and the geothermal pools of green & gold. Mmmmm these look delicious! Googly eyes on the rhubarb made me smile too haha. If iI think of more I will add. Have fun! When you’re in St. Louis, definitely stop at Ted Drewes…it’s been around forever, and has the best Frozen Custard in town.